Here are the principles Christian and I shared at the Applied Improvisation Network Conference in California yesterday. Here is also a video of people reflecting on one such online facilitation. 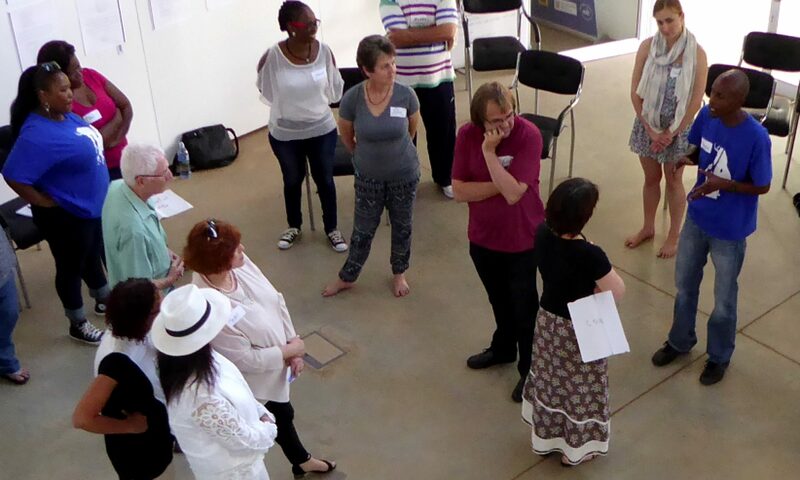 In facilitating, training, coaching it is crucial to (co)create a safe environment: An atmosphere, that supports participants to open up, to be ready to share their experiences and feelings using facial expression, gestures, sounds or tunes, visualizations, words. An atmosphere coined by intimacy, trust, connection, the willingness to listen and to collaborate. Using online-“rooms” with the help of live-online tools with possibilities to share audio, video, pictures, presentations, the screen of your PC/ Laptop / Smartphone needs some additional considerations related to building / sustaining a safe environment together. What is more, e-facilitation / e-coaching requires in some aspects a different intensity compared to working together in a physical space. This is because there are not four walls that contain the action and the activity. Containment needs to be created in other ways e.g. a strong visual or conceptual frame. People in very different places & time zones can meet and share aspects of their life. They are in their personal spaces, some of which can be seen in the background behind them. This brings a certain intimacy that is not there in offline spaces. The nature of vulnerability that comes with seeing yourself on camera must be acknowledged. This extra important when doing body work. In online rooms, people who are not contributing, more easily ‘disappear’ out of the mindfulness of the group and must therefore be called upon by name for a response. Here is a video of our AIN session. A cornerstone of a safe environment is everyone getting-to-know each other. If possible: start methods to support it sometime beforeh the first session. Some participants won’t use their camera, they should contribute a picture of themselves. You can use props – you can’t pass them around, but you could ask participants to find similar / related props at their places to create the ‘feeling’ of something described / shown. It is often necessary for participants to share information. What is the best way for a person to share files with other participants? E-Mail often is not the ideal answer. You could use Online-Folders, (hidden) Blogs & Web-Sites or learning-management-systems. Neutral public sharing tools are better than private emails. Stability of internet connections should be tested – and they can be wobbly or fail at any time. Participants should have possibilities to test / play with earphone & microphone and with features of the online-tool. It is advisable to schedule 10-15 minutes extra at the start of a session to sort out any technical challenges. Another technical and planning consideration is designing time slots where participants meet online in pairs or small groups (with or without you). Such breaks are valuable to change the energy, or to do pair work – just as the case may be in offline sessions. Please join us for our next online course: How do I do meaningful focused work amidst the business of living? Setting of the place, participants use during online session(s) needs consideration. Facilitators should highlight this in a preparation email. Will they be alone there? Is it a familiar place to them? Which background noises could be heard? What is the light in the room like? And is thee participant sitting in front of a bright window? Is it a place, where they can stand up and make some steps / movements? What can be seen in the background, when they use their video – what do they want to show and what not? Has the participant thought of providing her-/himself with a glass of water / brain-snacks? This is important. Because, in offline spaces we can provide this to participants, but online, people need to care for themselves. Combine possibilities of contributions via chat, audio, video, any kind of presentation. You can’t point at someone; therefore you could decide about an order who is first and who is next together or you name people. Foster role flexibility of your participants: they can also (temporally) take over tasks like moderation, documentation, presentation… and some of them will need preparation / support to succeed in this task. Role flexibility, real participation and a sustainable learning process is supported by tasks, that are tackled alone and in small groups before / between meetings. Previous PostPrevious How does one use embodiment in online rooms? Next PostNext Let’s solve the world’s problems in 90 minutes flat!